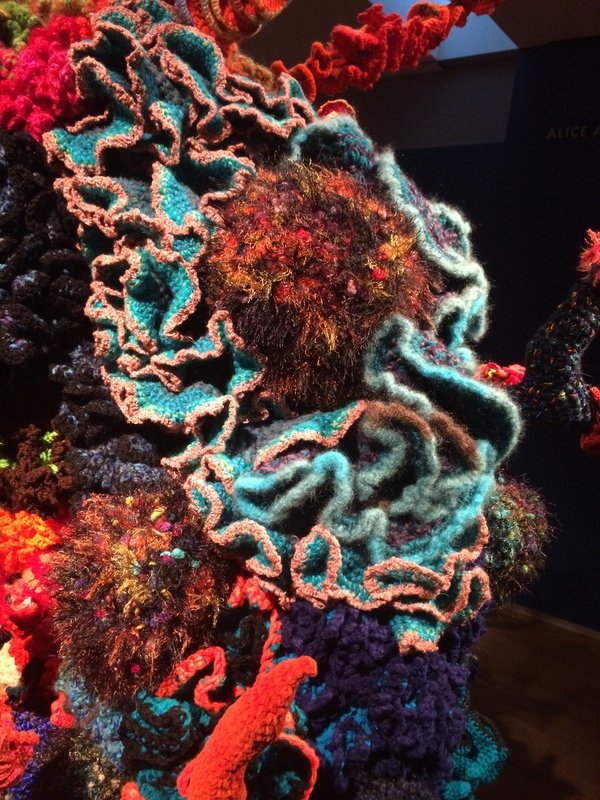 To celebrate tenth anniversary of the “Crochet Coral Reef” project The MAD museum in NYC is featuring an impressive installation. The project is the work of Margaret and Christine Wertheim through the organization they founded; The Institute for Figuring. 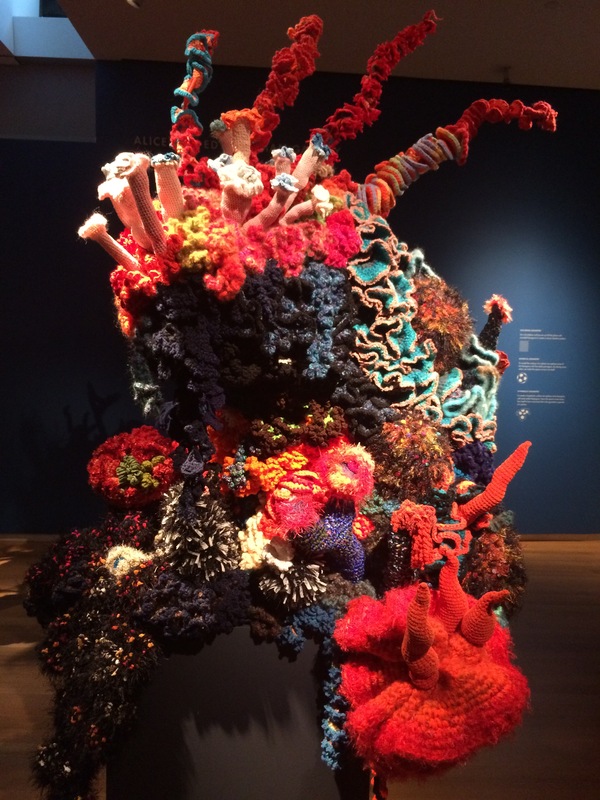 By utilizing the properties of the crocheting to create hyperbolic surfaces, they have created textile art that represents the complicated structures of coral. The first artist to create hyperbolic forms through this method is Cornell Mathematician Daina Taimina in 1997. The Wertheims elaborated on these geometries to create the organic forms now on display. 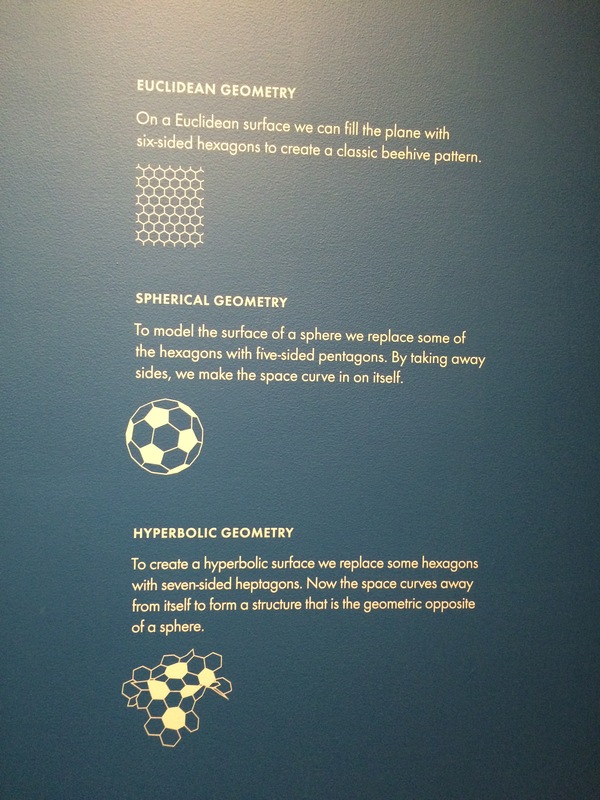 The wall texts at the Museum offer nice explanations of Euclidean, Spherical and Hyperbolic geometry. Some of the sculptures in the show are monumental in size, constructed with a multitude of forms. “Coral Forest-Eryali” 2007-14 Christine Wertheim and Margaret Wertheim, with Shari Portet, Marianne Midelburg, Heather McCarren, Una Morrison, Evelyn Hardin, Beverly Griffith, Helle Jorgensen, Anna Mayer and Christina Simons. The installations are very grand and beautiful but they also address numerous topics: the mathematical properties found in marine biology and the concept of “woman’s work” through the arduous communal effort to create these impressive structures. The most important topic, however, is the urgent need to inform the public of the dire situation of the world’s coral reefs. The warming earth, combined with water pollution from plastic trash, are endangering the living reefs. Even so, wishing everyone a happy and healthy New Year!